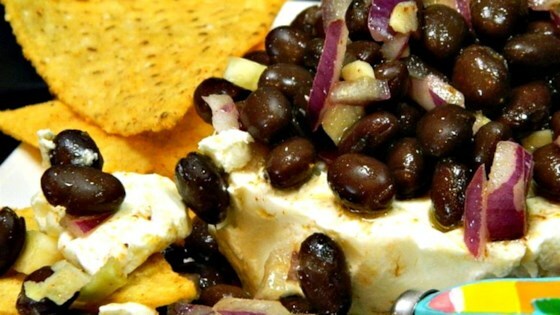 "Looks are deceiving with this black bean dip. Unless you love black beans, you might not think you'll like it, but my kids and their friends make it disappear at every gathering we've brought it to. So easy to make and simply delicious. Serve with tortilla chips." Stir beans, onion, garlic, oil, lime juice, salt, red pepper flakes, cumin, and black pepper together in a bowl. Cover the bowl with plastic wrap and refrigerate until flavors blend, about 2 hours. Spread cream cheese onto the bottom of a serving plate. Spoon bean mixture evenly over cream cheese.